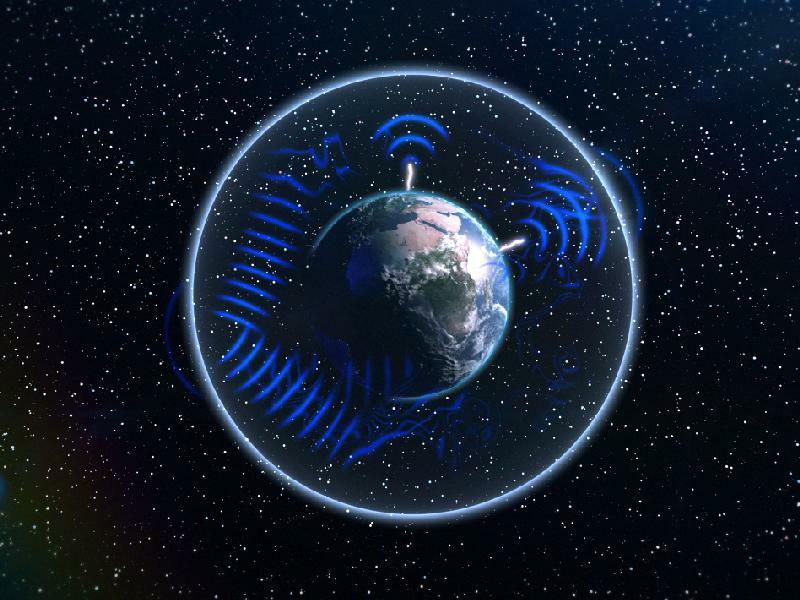 The Schumann Resonance is the result of magnetic waves “trapped” between the surface of the Earth and the bottom of the ionosphere, an area also called the ionosphere cavity. The ionosphere is a layer the atmosphere filled with charged particles, which begins about 60 miles up into the sky. Its very dynamic nature is due to the fact that, on the outside, it is exposed to the direct ultraviolet radiation from the sun. Magnetic waves that match the geometry of this cavity (their wavelength must be as long as the circumference of the Earth or a multiple) create a pulse named Schumann resonance after Winfried Otto Schumann (1888 - 1974), who inferred their existence back in 1952. These waves can be triggered by electromagnetic impulses such as those generated by thunderstorms on the whole planet. The Schumann Resonance has a basic frequency of 7.83 Hz and seven known overtones 14.3; 20.8; 27.3; 33.8; 39; 45 Hz. Therefore, the proper definition is Schumann Resonances. These frequencies can vary a lot during particular events such as big magnetic storms, and they tend to eventually go back to their constant values. The studies of the Hearth Math Institute have provided evidence that the frequencies of the Schumann Resonance match the frequencies of the brain and heart of human beings. There is an exchange of information when two systems vibrate at the same frequency (see section “Resonance”). Our brainwaves tend to synchronise intermittently (every couple of minutes) with the frequencies of the Schumann resonances. This brings about the hypothesis that we are constantly exchanging information with the Earth. This is even more so in the case of the heart, which, as numerous studies have shown, has a stronger and wider magnetic field than the brain. With regard to this, I'd like to mention a very interesting piece of information. In 2007, the HeartMath Institute conducted an interesting study to search for scientific evidence of intuition. Knowing from previous studies that the magnetic field of the heart can affect others around, they set up experiments to observe the connection between a baby's heart and the mother's brain. The aim of the experiment was to determine whether the mother's intuitive knowledge of the baby's needs could be determined by the interaction between these two systems. Indeed they found out that when the mother was focusing her attention on the baby, the baby's heartbeat could be detected in the mother's brainwaves. This experiment shows how when we are in a state of “coherence”, we are more open to the information encoded in electromagnetic fields. Our body seems to need this constant exchange of information. German scientist Ruetger Wever who made significant contributions to the field of chronobiology (the study of living organisms' biological rhythms), found out that when people spent weeks in an underground bunker, therefore not exposed to the Schuman resonances, they started developing various sicknesses. However, with the introduction of an artificial magnetic field at 7.83 Hz in the bunker, they would quickly recover. The magnetic field of the Earth could well be the medium of exchange of information between the Earth itself and human beings (and all living beings), and it may well work both ways, with human thoughts and emotion sending information to the the Earth's Magnetic field. I feel that C. G. Jung's Collective Unconscious and R.Sheldrake's Morphic Fields could be both related to this new understanding. Interestingly, since the 1990's we also know that there are magnetic particles in the human brain. Their function is not yet clear to scientists, but a series of studies in Germany has ruled out the possibility of external contamination, so their presence seems to be completely natural. Could they represent one of the ways our brains synchronise with the magnetic field of the Earth? Cryptochromes are proteins discovered in the 1990's first in plants, where their function is to absorb blue light, used to regulate growth. Subsequently, they were found in all living beings. In both plants and animals, the function of cryptochrome molecules seems to be absorbing light in order to regulate circadian rhythms and melatonin production. Cryptochromes in birds are sensitive to magnetic fields, they are present in the eyes of various species and it has been suggested that they allow birds to “see” the magnetic fields they use for orientation. A similar magnetic sense in humans is not officially recognised, but there is research that suggests that human cryptochromes are indeed capable of light-sensitive magnetic reception. With the increase of artificial low-frequency electromagnetic fields, the population of many species that heavily rely on the Earth's magnetic field for orientation has declined in numbers. These artificial fields interfere with the activity of the magnetically sensitive cryptochromes, disturbing biological life. The Schumann Resonances can no longer be measured in or around cities. Scientists have to do do it in the sea because artificial magnetic fields, such as the ones generated by mobile phones networks, have increased millions of times over the last 50 years. These frequencies can inhibit the pineal gland's production of melatonin, a hormone that is fundamental to the body's ability to regenerate itself. Melatonin is a powerful antioxidant and is produced by the pineal gland at night, while we sleep. But because the pineal gland is light sensitive, it misinterprets the artificial magnetic fields of mobile phones networks as light frequencies. This keeps the pineal gland working in daylight mode even when we are sleeping. It is not clear whether there is a direct connection between Purihach's findings of the 8 Hz magnetic field of healers and the Shuman Resonance fundamental frequency of 7.83 Hz. Personally, I would not find surprising if there was a connection, given the small difference between the two frequencies and the constant oscillation of living processes. As we have seen, the Schuman resonance is not a fixed, unmovable frequency and most probably the same can be said about the field observed by Puharich. There is a good reason to speculate the two fields resonate with each other, therefore exchanging information. The Hydrogen atom, which is one of the most omnipresent elements in the known universe, has a Nuclear Magnetic Resonance of 8 Hz.